Donald Trump's son-in-law attempted to set up secret communications with Moscow a month after Mr Trump's election, US media say. 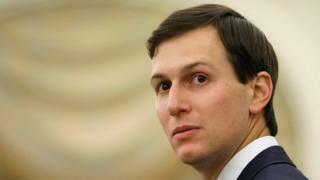 Jared Kushner wanted to use Russian facilities to avoid US interception of discussions with Moscow, the Washington Post and New York Times said. Mr Kushner, a senior White House aide, has not commented. He is said to be under scrutiny by the FBI as part of its inquiry into Russian interference favouring Mr Trump's win. Reports in the US say investigators believe he has relevant information, but he is not necessarily suspected of a crime. Imagine, for a moment, that Jared Kushner and Michael Flynn had succeeded in setting up secure communications with Russia that bypassed US government channels. The past few months might have turned out very differently. Mr Flynn's late December contact with Ambassador Sergei Kislyak to discuss the recently imposed punitive sanctions on Russia for meddling in the presidential election likely would not have been intercepted up by US intelligence surveillance. Without that intercept there would have been no urgent meeting between acting attorney general Sally Yates and Trump administration officials to discuss Mr Flynn's possible susceptibility to Russian blackmail. There would have been no leaks to the US media that eventually exposed Mr Flynn as having been less than forthcoming about those conversations to the public and Vice-President Mike Pence. Mr Trump likely wouldn't have felt compelled to fire Flynn from his national security adviser job in mid-February - a move the president reportedly still regrets. In this scenario Mr Flynn - who accepted money to advocate for Turkish interests last year and is currently under FBI investigation - could be in a top White House post to this very day. The most recent reports - which cited unnamed US officials as sources - said Mr Kushner had spoken with Moscow's Ambassador to the US, Sergei Kislyak, about setting up a back channel using Russian diplomatic facilities in America. The meeting was held in early December at Trump Tower in New York - Mr Trump's power base. According to both reports, Mr Trump's first national security adviser Michael Flynn was present at the meeting. The secret channel was supposed to be used to discuss Syria and other policy issues during the transition period between Mr Trump's election in November and his inauguration in January 2017. The Washington Post says the proposal surprised Mr Kislyak as it meant Americans using Russian facilities at their diplomatic missions in the US. The New York Times said the line was never established. What's unusual about a direct line to Moscow? The US and Moscow have always had a hotline - popularly referred to as the Red Phone, even though it was not a telephone. This was meant to enable the two superpowers to avoid nuclear catastrophe during the Cold War. Mr Kushner appears to be proposing a similar set-up. But what is unusual is that this would be a channel using Russian hardware. So this would have been outside official communications normally used by a team about to assume the leadership of the US - meaning US leaders were using Russian channels instead of their own. And, significantly, these communications would not form part of documented US policy-making. Very. Remember that Russian allegations of interference to sway the election in favour of Donald Trump emerged in May 2016 with the first reports of hackers targeting the Democratic Party. What followed were reports that US intelligence agencies had traced the breaches back to Russian hackers. In August, Wikileaks released 20,000 internal emails of members of the Democratic National Convention (DNC), stolen by the hackers. Mr Trump's then campaign manager, Paul Manafort, resigned after being accused of accepting millions of dollars in cash for representing Russian interests in Ukraine and US. In October, the US intelligence community released a unanimous statement formally accusing Russia of being behind the DNC hacking. So, by December when the alleged Kushner-Flynn-Kislyak meeting was held, the Trump team would have had grounds to believe in the existence of an investigation into the Russian links. Is Kushner accused of any wrongdoing? The Washington Post had already reported FBI investigators were focusing on meetings Mr Kushner held last year with Mr Kislyak, as well as a banker from Moscow, Sergei Gorkov. Mr Gorkov is the head of Vnesheconombank, which has been subject to sanctions imposed by the Obama administration in response to Russia's annexation of Crimea and its support for separatists in eastern Ukraine. The bank is under the control of Russian Prime Minister Dmitry Medvedev and other members of the government, and has been used to fund major projects such as the 2014 Winter Olympics in the southern Russian resort of Sochi. Mr Kushner has said he did not discuss sanctions with Mr Gorkov. His lawyer has previously said his client would co-operate with any inquiry. Could Trump be guilty of obstruction? How powerful is the special counsel?